The Bank of America Tower is a 617 ft (188 m) skyscraper in Downtown Jacksonville, Florida, United States. It is currently the 9th tallest building in the state of Florida, (the tallest 8 being in Miami). 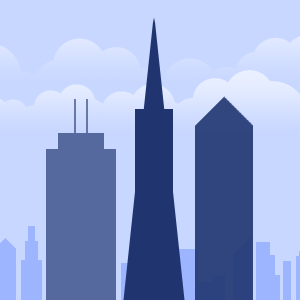 It was built as the headquarters of Barnett Bank and originally named Barnett Tower, but the name was changed in 1997 when Barnett was acquired by NationsBank, which soon merged with BankAmerica. 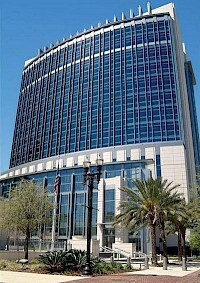 The Bryan Simpson United States Courthouse is a courthouse and U.S. federal government facility in Jacksonville, Florida. It houses: The courthouse was completed in late 2002 at a cost of $84 million and opened in early 2003. It replaced the old former courthouse, which was built in 1933 and had many indoor air quality problems, including illness-inducing mold and mildew. The new courthouse comprises 492,000 square feet (45,700 m) building. The Modis Building, also known as Modis Tower, is a skyscraper in Jacksonville, Florida. Standing 535 feet (163 m) tall, it is currently the city's second-tallest building. The tower was completed in 1974 by the Independent Life and Accident Insurance Company, and was known as the Independent Life Building.